Spencer's Retail is a leading retailer that operates multiple retail formats in India. While efforts are made to keep the information on this site accurate and timely, neither Spencer’s Retail Limited guarantee or endorse the content, accuracy or completeness of the information, text, graphics, hyperlinks and other items contained herein or on any other server. This site and the materials, information, and references to services and products if any herein, including without limitations, text, graphics and links, are provided "as is" without representations or warranties of any kind, whether express or implied. Products are mentioned on the site for the purpose of graphical presentation and may vary in terms of size, quality and other features. The Purchaser may ascertain the prices, quality and other aspects before purchase. To the fullest extent permissible, Spencer’s disclaims any warranties, express and / or implied, including but not limited to implied warranties of merchantability, fitness for a particular purpose, non-infringement, freedom from computer virus and warranties arising from course of dealing or course of performance. Spencer’s Retail Limited does not represent or warrant that the functions contained in the site will be uninterrupted or error free, that defects will be corrected or that the site or the server that makes the site available are free of viruses or other harmful components. Spencer’s Retail Limited does not make any warranties or representations regarding the use of the materials in the site in terms of their completeness, correctness, accuracy, adequacy, usefulness, timeliness, reliability or otherwise. Spencer’s Retail Limited is not responsible for any special, indirect, incidental or consequential damages that may arise from the use of or the inability to use, the site and/or the materials contained on the site irrespective of whether the materials contained on the site are provided by Spencer’s Retail Limited. All content included in the Site, such as text, graphics, logos, button icons, images, audio clips and software, is the property of Spencer’s Retail Limited or its content suppliers and protected by Intellectual Property Laws. The compilation (meaning the collection, arrangement and assembly) of all content on the Site is the exclusive property of Spencer’s Retail Limited and protected by Intellectual Property laws. All software used on the Site is the property of Spencer’s Retail Limited or its software suppliers and protected by Intellectual Property Laws. Any other use, including the reproduction, modification, distribution, transmission, republication, display or performance, of the content of the Site is strictly prohibited. The information, services, products offers advertised on the Site are the top offers available, including, without limitation, text, graphics and links, are provided on an "As Is" and are valid only till the stocks last. In addition, Spencer’s Retail Limited and its suppliers do not represent or warrant that the information accessible via the Site is accurate, complete or current. We are not responsible for typographical errors. Price and availability information is subject to change without notice. The contents of this site are subject to change without notice. Commercial use of any of the contents of this site in any manner is prohibited without prior written permission from an authorised person. No reproduction of any part of the site may be sold or distributed for commercial gain nor shall it be modified or incorporated in any other work, publication or site, whether in hardcopy or electronic format, including postings to any other site. Spencer’s Retail Limited reserves all other rights. This site may contain some hyperlinks which lead out of this site. Information contained in any site linked from this site has not been reviewed for accuracy or legal sufficiency. 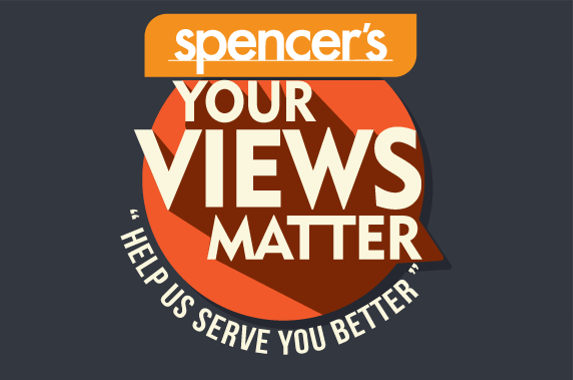 Spencer’s Retail Limited is not responsible for the content of any such external hyperlinks and references to any external links should not be construed as an endorsement of the links or their content. No information on this site shall constitute an invitation to invest in The Spencer’s Retail Limited or any of its entities. Neither Spencer’s Retail Limited nor their respective officers, employees or agents shall be liable for any loss, damage or expense arising out of any access to or use of this site or any site linked to it, including, without limitation, any loss or profit, indirect, incidental or consequential loss. By viewing this site you are deemed to agree to jurisdiction of the courts at Kolkata, India in respect of any action arising therefrom or related thereto. Privacy | Sitemap | Disclaimer | Copyright © Spencer's Retail 2016. All rights reserved.